In the past, many data center operators maintained low temperatures in their data centers as a means to prevent IT equipment from overheating. Some facilities kept server room temperatures in the 64 to 70 degree Fahrenheit range, however this required increased spending to keep cooling systems running. Recently, this practice has changed, as more data center operators increase temperatures in their facilities for improved efficiency and sustainability. Computerworld reported that the U.S. General Services Administration stated that data centers can raise the internal temperature of facilities from 72 degrees Fahrenheit to as high as 80 degrees Fahrenheit. This practice can save 4 to 5 percent in energy costs per degree increase, as less power is needed for the cooling system. According to recent report by the Uptime Institute, an increasing number of facilities are raising server room temperatures. The organization's survey of more than 1,000 data centers has shown that 7 percent are now operating above 75 degrees Fahrenheit, a significant increase from the previous year's 3 percent. Google has taken this practice to the next level, according to Geek contributor Matthew Humphries. The search engine's Belgium data center currently operates at levels as high as 95 degrees Fahrenheit. This has lead to significant savings for the company, as they utilize approximately half the energy of a typical data center. Additionally, Humphries stated that as a whole, Google's data centers are 50 percent more efficient than other comparable structures. Although some operators fear damage to IT equipment at such high temperatures, Google's facility illustrates that systems can operate safely within this kind of environment. "With the hardware in data centers clearly capable of coping with such high temperatures we should expect other facilities to take the same route in a bid to save money," Humphries wrote. In addition to savings, the hot air being removed from the server room can also be recycled to heat nearby homes, Humphries noted, providing benefits not only for the data center but the surrounding community as well. In order to take advantage of this trend, Uptime Institute content director Matt Stansberry told ComputerWorld that staff should take steps to manage equipment in a higher risk environment. A main way to ensure the success of operating a data center at a higher temperature is to utilize a temperature monitoring system. 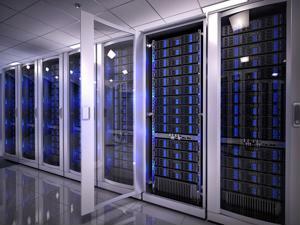 This type of technology ensures that the server room temperature stays within the programmed range. Additionally, a high temperature alarm can alert key employees if the server room goes above this target.